Allora & Calzadilla: Echo to Artifact is the first major exhibition in Canada by the artists Jennifer Allora and Guillermo Calzadilla. Held at the Art Gallery of Alberta in Edmonton, Canada, the exhibition features film, sculpture, sound pieces and performances, as well as new work based on the artists’ research into western Canada’s prehistoric past. 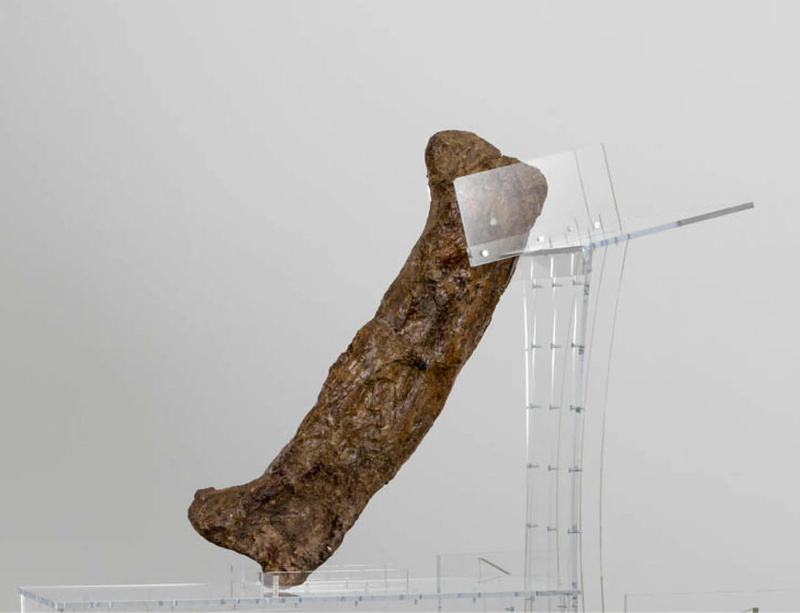 The works in the exhibition consider the nature of sound, music and the voice as a way to animate both natural forms and man-made artifacts and include the remains of dinosaurs, a piece of Hadean rock and the oldest musical instrument ever discovered. The exhibition draws on a research trip the artists took to Alberta in the summer of 2014, when they visited Burgess Shale and the Royal Tyrrell Museum of Palaeontology. A main feature of the artists' exhibition at AGA is the sculptural installation, Intervals, which is made of transparent acrylic lecterns and dinosaur bones. These works accompany Lifespan, a live vocal performance centred on a piece of the Earth’s mantle from the Acasta River Gneiss (NWT), estimated to be over four billion years old. Echo to Artifact also includes three films: Apotomē (2013), 3 (2013) and Raptor’s Rapture (2012), all of which stem from the artists’ research into specific historical artifacts and their musical affinities. The Great Silence (2014), a three-channel video installation, focuses on the world’s largest radio telescope, which transmits and captures radio waves to and from the farthest edges of the universe. Located in Esperanza, Puerto Rico, it is also home to the last members of an endangered species of parrots. The exhibition runs from 2 June until 28 August 2016. More information on the exhibition and a schedule of live performances is available here.